A heavy harpoon for bearded seals, beluga whales, and walrus, with a toggling head that penetrated the animal and then turned sideways so it would not pull out. Even after hunters switched to guns, they used harpoons to fasten lines to wounded animals. Theresa Nanouk: This is another spear, for bigger animals like whales, right? Oscar Koutchak: Yes, this is a spear, maybe for a bearded seal, maybe for a beluga. And it seems to be in pretty good order. Art Ivanoff: Is that [shaft] wood? Oscar Koutchak: Yes. There’s bone over here [socketpiece and foreshaft], but there’s also metal. Theresa Nanouk: Oh, look at this [finger rest]. It’s made out of bone. Anna Etageak: For when they put them on the kayak. Oscar Koutchak: That’s to hold it [harpoon] steady against the incline of the kayak to keep it from rolling over. Anna Etageak: Maybe when at the edge of the ice, they just use this [ice pick at end] when they want to get out of the kayak. So they won’t tip over. Art Ivanoff: So he’d spear it, and this [line] would come off and unravel. Oscar Koutchak: Right. When you shoot a mammal, like for instance a bearded seal, they weigh about four or five hundred pounds. Sometimes you shoot them with a twenty-two [caliber rifle] and you kind of stun them. And they take a deep breath, and they hold their breath, and they stay afloat a little while. Theresa Nanouk: They always sink. Oscar Koutchak: Yes. There’s a chance for him to spear it. Otherwise, they’ll just sink. But if they hold their breath for just one minute or so, he’ll get a chance to retrieve them with this [harpoon]. Then they could sink, but it’ll hold them up. Theresa Nanouk: They sink because their blubber is thin. But when their blubber is thick, they don’t sink. Oscar Koutchak: Yes, some of them. But there’s not enough line over here I don’t think. Usually there’s long line. It’ll unravel real fast. This [line] will be going like this [fast spiraling] while they’re sinking. 1. According to Frances Charles, babiche is “sealskin rope, sealskin line” and is made from strips of scraped, untanned sealskin. The word is adapted from Canadian French and originally from Algonquian. 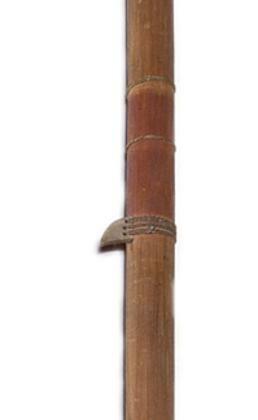 Harpoons, used for hunting seals, walrus, beluga whales, and bowhead whales, were the heaviest Iñupiaq weapons. They have thicker wooden shafts than the lightweight darts that were used for seals, and unlike darts were always thrust or thrown by hand rather than launched with a throwing board. (1) Harpoons have “toggling” points (heads) rather than the slender barbed points seen on darts. The basic parts of a harpoon are the detachable head, foreshaft, socket piece, wooden shaft, and harpoon line. Toggling heads were made of bone, ivory, or antler, with a slot at the end to hold a thin stone or metal blade. This type is spurred at the base and has a hole for insertion of the slender foreshaft. (2) It was connected to the harpoon line with a short leader, which enabled quick replacement of the head if it broke. (3) The foreshaft—which improved penetration of the harpoon head—fit into the socket piece and was tied to the shaft so that it would not be lost. The heavy socket piece was made from bone or ivory, and its weight helped the weapon to hit with great force. By the turn of the 19th century, the use of harpoons had begun to change.